We would love to show you around our magical farm so please contact us on 01580 441571 or [email protected] for an appointment. Our philosophy at Frame Farm is to be as environmentally friendly as possible and so we encourage the use of car sharing, bus hiring, taxis and the use of public transport. Frame Farm is under 10 miles from the A21, which runs from junction 5 of the M25 south to Hastings. We are conveniently located between the picturesque village of Benenden and Iden Green, and within easy reach of Royal Tunbridge Wells, Maidstone, Ashford and Hastings. We can provide secure storage for your bicycle. 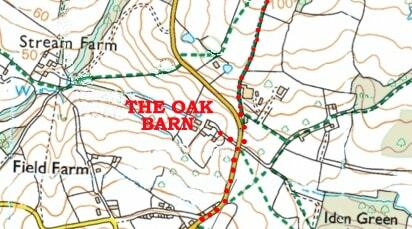 There are two footpaths which lead directly to The Oak Barn at Frame Farm (N.B. 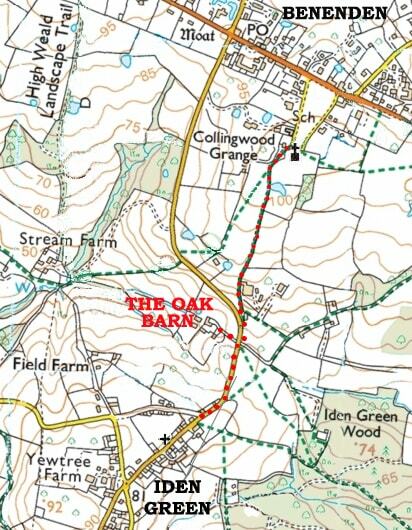 the red dots on the map) and only takes about 5 minutes from Iden Green and 10 minutes walk from Benenden. 1. Staplehurst and Headcorn from London to Ashford International, Dover, Ramsgate and Canterbury. There is a lift at Staplehurst, and local minicab offices are located at both stations. 2. Etchingham and Robertsbridge from London to Royal Tunbridge Wells, Tonbridge and Hastings. National Rail Enquiries: www.nationalrail.co.uk / 08457 484950.